The construction industry has a problem. Over the next 5 years, the industry is projected to lose as much as 20% of its workforce to retirement. Losing workers to retirement will continue to be a problem, as—according to The National Craft Center for Construction Education and Research (NCCER)—the average age range for craft professionals is 48–52. Combined with the 2 million workers lost during the recent economic recession, the industry is facing a serious dearth of qualified labor. In the beginning of 2015, the Associated General Contractors (AGC) of America released results from a study that measured the extent of worker shortages across the United States. The survey found that 83% of responding firms are having difficulty filling craft worker positions, including carpenters, equipment operators, and laborers; another 61% report difficulty filling professional positions, such as project supervisors, and estimators. Confidence that these conditions will improve is low, with 70% of firms responding it will become harder or continue to be hard to hire construction professionals. But, can these workforce shortages be blamed entirely on the recession and the number of soon-to-be-retiring workers? While these factors certainly have a significant effect, there are other variables that have led to the current labor shortage. One main culprit is the lack of younger people entering the construction industry. Jennifer Wilkerson, Director of Marketing for NCCER, said the problem started when technical training became known as vocational education. It became viewed as something that was an alternative to traditional school—and not necessarily a positive alternative. Particularly after the signing of the Serviceman’s Readjustment Act (commonly known as the GI bill), which guaranteed paid college for veterans, college was promoted as the only road to success. Technical education programs became less of a focus and secondary education focused exclusively on college-track programs, while other career routes were thought of as less valuable. Tim Johnson, Founder and CEO of the TJC Group and an expert on workforce development in the construction industry, adds that the problem is not merely a lack of workers, but a significant increase in construction activity. In particular, petro-chemical, natural gas plants, and gas-to-liquid projects have seen a significant increase as the price of natural gas has come down. Numerous organizations have predicted increases in construction spending and the demand for workers. The American Institute of Architects (AIA), estimates overall nonresidential construction spending will go up 8.2% in 2016, and the Freedonia Group, an industry market research organization, is also projecting that U.S. demand for insulation will advance 7.6% annually in 2017. Correspondingly, the demand for insulation workers is projected to grow by 46.5% by 2022, according to the Bureau of Labor Statistics (BLS), and the Manpower Group, which researches global talent shortages, estimates that 1.5 million new craft professionals will be needed between 2016 and 2019 in the United States alone. Given these projections, increasing numbers of skilled workers will be absolutely necessary to meet rising demand. Part of the battle of recruiting younger workers is to change the terminology surrounding construction work; one important step is the move to change the language regarding trades education from vocational education to technical educational, said Wilkerson, which will help change the perception for this type of work. In recent years, the skyrocketing cost of college education also has high school students looking at different career alternatives. While the career path for many degrees is uncertain, the demand for construction workers and craft professionals is projected to continue to increase. 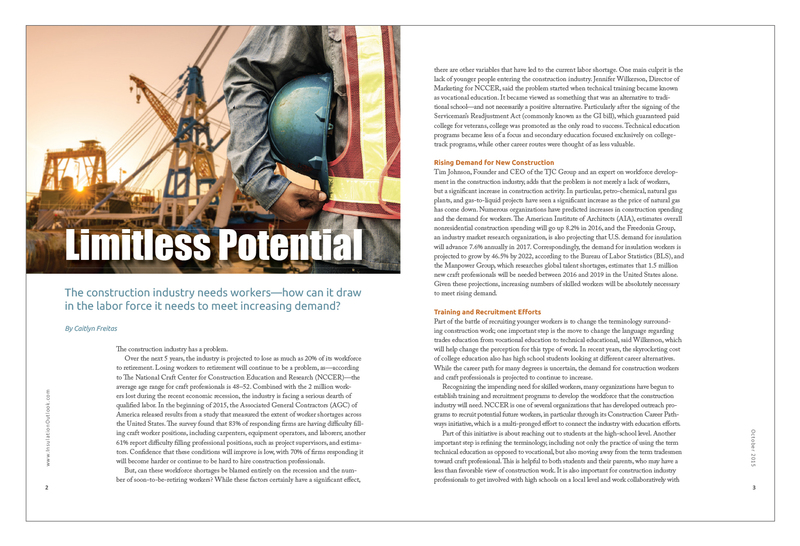 Recognizing the impending need for skilled workers, many organizations have begun to establish training and recruitment programs to develop the workforce that the construction industry will need. NCCER is one of several organizations that has developed outreach programs to recruit potential future workers, in particular through its Construction Career Pathways initiative, which is a multi-pronged effort to connect the industry with education efforts. Part of this initiative is about reaching out to students at the high-school level. Another important step is refining the terminology, including not only the practice of using the term technical education as opposed to vocational, but also moving away from the term tradesmen toward craft professional. This is helpful to both students and their parents, who may have a less than favorable view of construction work. It is also important for construction industry professionals to get involved with high schools on a local level and work collaboratively with teachers to give students the information they need to know about various career options. Having career events at high schools has proved to be useful in generating interest in construction careers. After holding a career event for grades 9–12, NCCER surveyed a portion of attendees to gauge the students’ reaction. Out of these attendees, 37% responded that they had already decided on construction, 73% said they viewed construction more favorably, 93% said the event made them view construction careers more favorably, and 23% credited the event with making them decide they wanted a career in construction. There are other examples of successful local efforts to develop a skilled construction workforce. In San Antonio, Texas, the Construction Careers Academy (CCA) offers prospective students 4 “strands” to educate them on careers in architecture, construction management, engineering, and the trades. As a result, in fall 2014, 505 eighth-grade students applied for the 159 available spots in the next available freshman class. The Associated Builders and Contractors (ABC), Central Ohio chapter, also created a public charter high school for construction. Organizations can use these examples to create their own educational programs. Assistance is also available through programs like the aforementioned Construction Career Pathways, which can help to put contractors in contact with educators to facilitate the development of educational opportunities to train future construction professionals. In addition to focusing on education at the younger level, many organizations are reaching out to another untapped source of workers—veterans. There are approximately 240,000 to 360,000 transitioning military workers every year. This group tends to have many qualities that fit well with construction careers, including leadership skills, punctuality, responsibility and the ability to work with a team and take direction. Additionally, many military specialties may translate well to certain construction trades. The Veterans Administration (VA) has provided funding to analyze the skills of military members to see how they may be applied to other trades. NCCER and Pearson Education have also teamed up to offer 1,000,000 dollars’ worth of online Core Curriculum training to transitioning military and veterans—free of charge. The Core Curriculum training will provide the basic skills needed to continue education in construction craft areas. While recruiting and training new workers is absolutely critical, it is important to develop further training opportunities for those already in the construction industry. Johnson commented, “I think sometimes we put all our focus on recruiting and training new people and we ignore the 6 million people out there who have already chosen this field—so absolutely no convincing required.” Part of the reason for training deficits may have to do with lower participation in organizations that provide training opportunities. Accordingly to the BLS, union representation has decreased somewhat among construction workers from 2008 to 2013. Unfortunately, this also leads to a decrease in the number of individuals taking advantage of union-based apprenticeship training programs. Moreover, while many open-shop contractors do offer training for new employees, federal and state regulations make it difficult for open-shop contractors to collaborate with one another to develop training programs due to anti-trust rules. Companies may also hesitate to fund training programs if there is no guarantee students will end up at their firm. To combat these issues, the industry can advocate for increased governmental funding for more technical education programs, which has decreased over the past several years. Individually, companies can work with organizations that offer training and certification to develop their current workforce. Working in the construction industry offers a unique combination of benefits to potential employees. 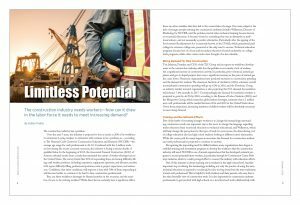 One of the most obvious benefits that construction companies can market to potential employees is the significant earning potential coupled with relatively inexpensive and quick training requirements. According to College Board, average college costs for an in-state public college in 2014–2015 were $23,410; costs for a private college averaged $46,272. That adds up to a $93,640 price tag for a 4-year degree at an in-state public college and $185,088 for private college. The average costs for a trade-school degree, on the other hand, add up to only $33,000. To pay for the continually rising costs of 4-year colleges, most students—nearly 70%—need to take out loans; the average 4-year student graduates with an average of $28,400 in debt. This can be a significant burden on college graduates entering the workforce. 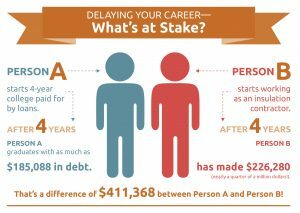 Moreover, those who choose a 4-year college plan often also experience a loss of earning time due to a delay in starting a career—this can lead to hundreds of thousands of dollars in lost wages. Combined with sluggish labor markets for many degrees, this can leave graduates in a position of having extensive debt and correspondingly few career options. 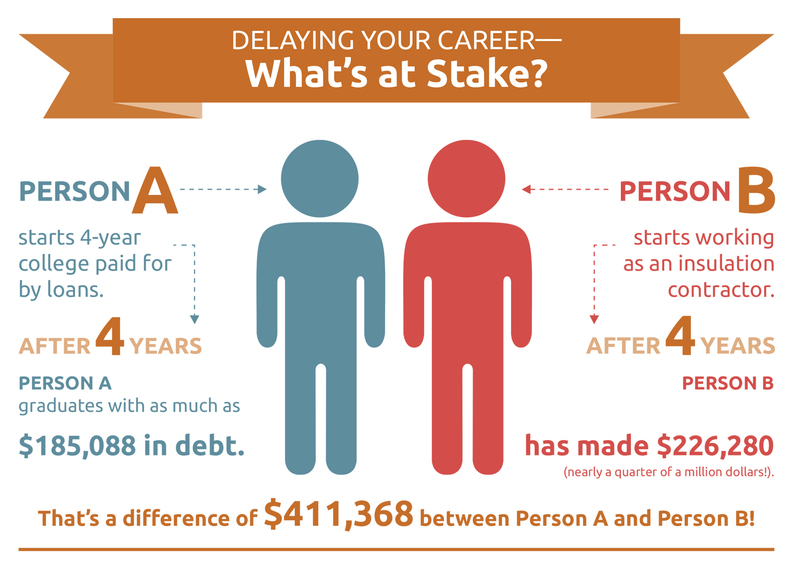 To see exactly how much money can be lost while waiting to obtain a 4-year degree, see the infographic below. According to the BLS, the median annual wage for those with a bachelor’s degree is $67,140. The annual wages for many construction trades are not far behind, and in many cases are even higher. Mechanical insulation workers, for example, have an average annual salary of $56,570, according to May 2014 data from the BLS. Additionally, an insulation contractor member of the National Insulation Association (NIA) affirmed that starting out, annual wages can easily equal more than $80,000 when including overtime hours. Another NIA insulation contractor said that starting pay—depending on region—can be surprisingly high. At his company, he noted, an estimator starts out with annual wages between $50,000 to $75,000, and these can go up to as much as $110,000 with experience. Given the low training costs and the generally shorter training time, many craft trade workers will find themselves in much better financial shape than those who attend a 4-year college. NCCER recently did some research comparing the cumulative lifetime earnings of an 18-year-old that goes into craft training versus an 18-year-old that purses a 4-year degree. When taking the debt of the degree into account, the person that pursues the bachelor degree will not catch up to the earnings of the craft professional until they are between 38 and 40 years old. Construction workers also report higher levels of happiness than workers in many other industries. A recent report by TINYpulse put construction workers among the top industries in terms of worker satisfaction. Companies can capitalize on this potential by investing in their workforces and offering increased training opportunities, focusing on providing consistent employment, and marketing the aspects of construction and trades careers that are most appealing. Johnson points out that many potential employees are looking for careers that can offer a good salary, but do not come with the requirement of spending all day in an office—many construction careers offer flexibility and hands-on work that appeal to those looking for non-traditional office work. The idea of working on projects that will last and can make a difference to the community can also prove to be an excellent recruitment tool. Rick Smith, former NIA President and current CEO of E.J. Bartells, an insulation distribution company, said of younger workers in particular, “They like the freedom to create, make decisions, and know that they are having an impact.” Construction and trade work is unique in that it creates a tangible, finished product; the ability to see a finished product is not always common, and can be a significant draw for many potential employees. This article was published in the October 2015 issue of Insulation Outlook magazine. Copyright © 2018 National Insulation Association. All rights reserved. The contents of this website and Insulation Outlook magazine may not be reproduced in any means, in whole or in part, without the prior written permission of the publisher and NIA. Any unauthorized duplication is strictly prohibited and would violate NIA’s copyright and may violate other copyright agreements that NIA has with authors and partners. Contact publisher@insulation.org to reprint or reproduce this content.